English: The Campanella of the Blessing! The story takes place in a trading city Ert’Aria. Leicester Maycraft is an item engineer belonging to an adventurer guild "Oasis". One night, he is at a party with his friends to see a meteor stream on the rooftop of a chapel. One meteor grazes them and hits the steeple of the chapel. There he finds a secret room and a sleeping girl. The girl wakes up and says "You must be my father!". The encounter with the mysterious girl brings an unexpected adventure to Leicester. 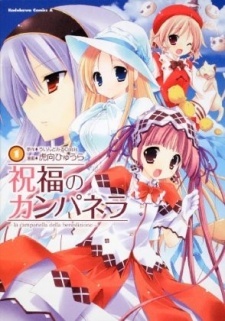 Parent story: Shukufuku no Campanella - Balzare! Tortilla Sisters!